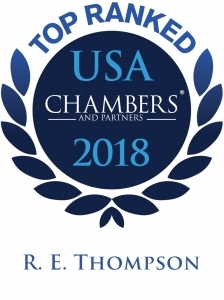 R. E. Thompson is an experienced practitioner in the area of civil litigation, primarily involving commercial disputes, products liability, class actions, malpractice, negligence, and insurance. R. E.’s experience also includes administrative law hearings, government relations and lobbying. In addition to his legal practice, R. E. has a long history of public service. He has served as a United States Attorney for the District of New Mexico, a New Mexico State Senator, a member of the National Conference of Commissioners on Uniform State Laws and the U. S. Attorney General’s Advisory Committee of U.S. Attorneys. He has also served on New Mexico Supreme Court Committees, including the Rules of Evidence and the Rules of Civil Procedure. He is a Hearing Officer for the Disciplinary Board. Additionally, R. E. has served as out-of-state liaison for the Board of Directors of the State Bar of Texas. Recognized by Chambers USA Directories of America’s Leading Lawyers for Business as a Senior Statesman for General Commercial Litigation, R. E. enjoys widespread respect among interviewees as “a gracious and humble man, and one of the deans of the litigation Bar.” Named Outstanding Civil Defense Lawyer by the New Mexico Defense Lawyers Association in 2010, R. E. has also received recognition as one of the Top 25 New Mexico Southwest Super Lawyers. He is listed in Best Lawyers of America® and was named Lawyer of the Year in Albuquerque for Government Relations in 2013 and for Litigation – Construction in 2014. R. E. has achieved an AV® Preeminent rating from Martindale-Hubbell, based on a peer review. 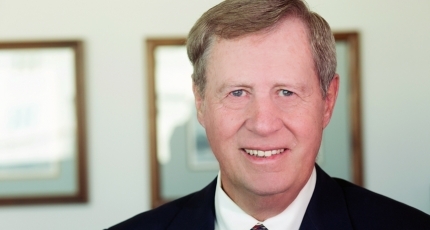 In addition, New Mexico Business Weekly honored him as Best of the Bar in Litigation in 2009. R. E. serves as Chair of the firm’s Tort, Product Liability and Class Actions Group, is Chair of the Insurance Industry Service Group, Vice-Chair of the Construction and Design Industry Service Group, and previously served as President and Chair of the firm’s Executive Committee. Successful appeal for nursing home, the New Mexico Court of Appeals overturned what had been New Mexico’s largest personal injury verdict of $53.2 Million ($3.2 in compensatory, and $50 Million in punitive) in a case involving a woman who died in a nursing home. See Keith v. ManorCare, Inc., 218 P.3d 1257 (2009). Appeal of a motion to dismiss for failure to state a claim upon which relief can be granted. Several campers were killed when a pipeline exploded. Professional rescuers sued El Paso Natural Gas Company, contending that they suffered severe emotional distress from having performed rescue services to the campers. The case reformulated the firefighters rule. See Baldonado v. El Paso Natural Gas Co., 176 P.3d 277 (2007). Successful appeal for oil company which had operated an oil and gas lease since 1927. Plaintiff contended that she had not joined in an operating agreement signed by her husband and that she was therefore entitled to part of the production of oil and gas from the leases. The trial court granted summary judgment in favor of the oil company based upon the doctrine of laches. The New Mexico Supreme Court affirmed. See Skaggs v. Conoco, Inc., 957 P.2d 526. Plaintiffs alleged that a homebuilder acted in concert with an interim lender and permanent financing institutions on a construction project and violated the state Racketeering Act. The trial court dismissed the plaintiffs’ claims and the New Mexico Supreme Court affirmed that dismissal, holding that the financial institutions had not engaged in a pattern of racketeering activity and had not committed predicate acts as defined in the Racketeering Act. See Maxwell v. Wilson, 766 P.2d 909 (1988). A city councilman brought a defamation suit against a newspaper following publication of an editorial that referred to the “Mexican mafia.” The trial court refused to grant a motion for summary judgment and the Court of Appeals reversed, holding that the statement was an expression of opinion that was protected from a defamation suit under the First Amendment. See Mendoza v. Gallup Independent Co., 764 P.2d 492 (1988).